As long as it's been in existence, the Assassin's Creed franchise has banked a ton of its appeal on authenticity. All the games in this series - even on the last generation of consoles - boast some of the most meticulously crafted and beautiful in-game environments of all time. From the dusty streets of Medieval Damascus to the glistening marble of Florence to the tree-pocked snow drifts of the wilds North America, every Assassin's Creed game has made players feel like they're lost somewhere in time. The pre-Revolution Paris in Assassin's Creed 5: Unity is no different. Visually speaking, that is. The Gothic grandeur of the city is present and correct from the moment the game's protagonist, Arno Dorian, sets foot in its swill-filled streets. Notre Dame looms over the centre island like a Gothic scorpion. The Pantheon spreads its buttresses wide. Versailles' pomp and splendour indicate just why the revolution happened. It's just a pity everyone in Paris sounds like they’re from the East End. Or Yorkshire. Or Liverpool. But accents are hardly the game's raison d'être. Assassin's Creed: Unity wraps multiplayer modes around the familiar free-running, stealth and assassinate regime, but does it make for a game that breaks the mould and makes something truly special on the new-generation of consoles? It may be unfair to harp on about the English accents in Unity, but they don't half break the game's immersion somewhat. Sure, the dialogue in the Ezio-helmed games that came before was in English, but the Italian inflections in the accents helped make the case more than Unity. Here, the protagonist delivers a flowery monologue in English RP and then yells "Merde!" at the end of it. It just sounds weird - although nowhere near as weird as a mission in which Arno listens-in on a Templar meeting that the leader closes by saying, "Right, let's close up and go and get a pint!" Seriously. Mind you, how much authenticity do you need? This is a franchise that dovetails actual historical events with a narrative that stars a protagonist who can swan dive off a structure fifteen stories up into a hale bay and emerge unscathed. 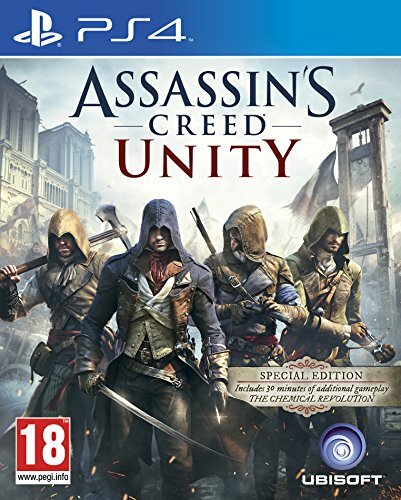 If you're on board with Assassin's Creed already, Unity will tick all of your boxes and then some. Assassin's Creed: Unity doesn't break the mould for this series, but it's a solid game experience nonetheless. The game's plot sees Arno, a young aristocrat, join the Assassins in their war against the Templars for reasons that are purely personal, but his quest soon becomes about more than just himself. The game's mechanics will be familiar to anyone who has ever played an Assassin's Creed title - as well as accessible to anyone who knows nothing about this series and takes the time to learn. The lion's share of gameplay is taken up by free-running through the sprawling environment and engaging in the odd bout of combat. The controls for the latter have been streamlined somewhat and the latter has been made more challenging; you can't spam the same defence mechanic and automatically win every fight. There's are some new additions, such as the "last position seen" mechanic, whereby a transparent blue ghost of your outline appears on screen when spied by an enemy. You don't need to be fully engaged in combat for this to happen, merely rouse suspicion - which can be used to your advantage to ambush potential assailants. Off mission, there are a boatload of activities to keep you entertained too: investigate murders, solve riddles, renovate properties, engage in dynamic events, pick up collectibles, open Eagle Viewpoints and even take on missions to different time zones. Whether in the daytime sun, evening dusk, or the dark of night, the shifting time of day and beautiful lighting effects make this undeniably the best-looking Assassin's Creed title to date. And not a splash of sea water to be seen anywhere, showing a definitive push away from the pirates and pillage theme of the earlier Black Flag title. The conceit in Unity is that Arno's activities are part of some search for evidence to use against Abstergo, the shadowy company set in the present day that's at the heart of Assassin's Creed. However, apart from a couple of cutscenes and some nonsensical data-gathering missions, the present-day narrative barely gets a look-in. Perhaps this is because Ubisoft is as befuddled as everyone else with what to do with the Abstergo storyline. It's been embedded in the franchise since day dot, but after Assassin's Creed III it was pared down to its bare essentials and here, in Unity, it's almost dumped out the window altogether. Good thing too as Arno's story may be pure pulp, but at least the idea of a secret war humming beneath the events of pre-Revolution Paris is more believable than the notion that virtual reality contains the information to set mankind free (if you're a newcomer: that's how workers are "sent in" to the Creed world, it's all very Matrix). To be frank, Assassin's Creed is now the video game corollary to the TV show Lost; it's doubtful that the writers know where the narrative is going and until sales threaten cancellation they're under no pressure to offer any resolution, provided everything remains well written and engaging. Which is still the case. Unity's big new feature is co-op play on the same map as the main story missions. Up to four players can dive into the mayhem and it changes the dynamic of play knowing someone has got your back. Whether less stealthy, or just the ability to help assist in clever distractions or take-downs, there's a new joy in that. It's relatively easy to hook-up with other players and tackle co-op missions dotted around the map, which are divided into two categories: assassinations and heists. Neither type disappear from the in-game map once completed so they provide endless opportunities to grind, just as long as a couple of friends are online. Grinding, incidentally, is what Unity is all about. It's possible to cane Unity's single-player campaign without any help, but the difficulty spike rises sharply from about the midway point and unless you're prepared to submit to the game's stealth constraints at that point they'll find forward progression tough going. Unity is far easier to tackle if you're prepared to engage in its myriad side quests, co-op missions and dynamic events before moving forward. The ability to unlock more content in the form of talents, weapons, armour and equipment also comes in handy. A lot of these items are kept off-limits unless you dive whole-heartedly into the multi-tiered, multi-player and multi-platform nature of the game. If you want to completely rinse Unity of its content then be prepared to accept every avenue the developers have prepared for the game. Assassin's Creed 5: Unity is a sprawling beast of a game. It doesn't reinvent the wheel for this series, but it takes what made it special and ramps it up to widescreen proportions. You'll be able to lose yourself in pre-Revolution Paris for weeks at a time given the sheer breadth of the landscape and missions available. Not to mention the additional fun of multi-player. It's the best looking game in the franchise by a country mile too, from the seas of characters on the streets to the architecture, weather effects and the changing light all adding their "wow" moments. Innovation isn't exactly on the cards though, as the game doesn't revolutionise the gameplay like its pre-Revolution setting might insinuate, but Unity delivers what the faithful expect and what they want - and isn't that what a triple-A blockbuster is all about?